As an opening critical remark, let me be clear that I do not use The Divine Liturgy myself, nor do I have any plans to. While I applaud the book’s editors for giving UGCC parishes a “one stop shop” liturgical text as opposed to expecting them to possess all two-dozen liturgical books necessary for a complete run of the Byzantine office, many of the renderings are foreign to my ears and some are—by my “conservative lights”—rather unimpressive. But no translation is perfect. There are certainly many constructions in my English-language Eastern Orthodox books that are off balance and confusing; I’ve just grown accustomed to them. 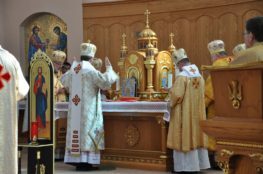 My larger concern about a text such as The Divine Liturgy is that will become the “final volume” for the UGCC in North America, thus normalizing its contentious abbreviations of certain landmark Byzantine services which many Orthodox parishes in the United States continue to serve despite mixed attendance. On the other hand, Greek Catholics face a steeper uphill battle than the Orthodox when it comes to reinvigorating their liturgical culture. Eastern Catholics living in the West have long had to “compete” liturgically with their Latin brethren, resulting in significant pressure to eliminate “extra” services and shorten the Divine Liturgy. What is “better”: To serve a truncated form of Matins every Sunday or no Matins at all? Is shaving 45 minutes from the Vesperal Liturgy for Holy Saturday “worth” giving to the faithful a service rich in Old Testament readings and classical hymnography? Admittedly, in a “perfect world,” such questions wouldn’t be asked. We are a long way from that state, however. To his credit, Galadza recognizes this and is trying to do the best that he can under suboptimal conditions. These are all minor quibbles, really. Where I really part company with Galadza is with respect to his apparent interest in developing new musical settings and choral pieces for UGCC worship in North America. Although he does not go into great detail on these points, I believe it would be highly imprudent for the UGCC—or any Eastern Catholic church—to begin “toying” with its liturgical tradition when the process of recovery and restoration is far from over. 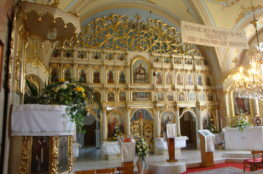 As Orthodox jurisdictions like the Orthodox Church in America and the Russian Orthodox Church Outside of Russia have already demonstrated, it is possible to adopt traditional musical settings for English-speaking parishes and, just as critically, to integrate the entire congregation into chanting them (at least the ordinary). Perhaps a time will come when Eastern Christianity will grow deep enough roots in North America that it begins to organically generate its own authentic elements and style, but that’s a question for another century or so. “at least the propers” —> “at least the ordinary” ? One somewhat disturbing feature of abbreviations in byzantine Catholic service books (Melkite, Ukrainian, and Ruthenian) has been that the publication of these abbreviated books is often accompanied by strong mandates that these books and ONLY these books be used in parish (or even monastic) liturgical celebrations, removing the option to celebrate the services more fully. Now there are pretty good reasons to just ignore these mandates, citing Orientalium ecclesiarum, for instance, ” All members of the Eastern Rite should know and be convinced that they can and should always preserve their legitimate liturgical rite and their established way of life, and that these may not be altered except to obtain for themselves an organic improvement,” but there’s still a degree of cognitive dissonance. There are good and bad things about the Melkite liturgical renewal, reading Patriarch Gregorios III (Laham), et al. in the short book, “On the Renewal of the Liturgy of Saint John Chrysostom in the Melkite Greek Catholic Church”. It’s a very quick read if you get a chance, I’d love to hear your thoughts. There really hasn’t been in the U.S. a grappling with the need for the Eastern Catholic Churches to conform themselves to Orthodox usages and be aware of what’s going on in Orthodox parishes. Antiochian practice, particularly, seems to be moving in a “pan-Orthodox” direction and Melkites will find themselves out of step if they don’t pay attention. Up until recently, it was arguable that the Antiochian Archdiocese was distancing itself enough from its Antiochian roots that this might not be an issue… what with the prospects for the Episcopal Assembly process, but with the Antiochian’s reaffirmation of their links to the Patriarch of Antioch and the expectation of increased immigration over the coming years, it seems that the Melkite Church needs to pay attention to this. There’s some of this attention being paid… I noted that the recent Sophia mentions that the Melkite seminarians at the Byzantine Catholic Seminary sometimes attend Sunday Divine Liturgy at Antiochian Orthodox Churches! Big continuing problem for byzantine Catholic Churches… lack of Saturday evening services (and I don’t mean Divine Liturgy!). Here in New York City, the Russian Catholic parish is, I believe, the only one that offers Vespers, while it’s standard at a great number of the Orthodox parishes in the city. Perhaps you are unfamiliar with Ruthenian-Ukrainian liturgical and sacred musical traditions. The development of “new musical settings and choral pieces for UGCC” has continued, unbroken, throughout the history of the Kyivan Church. In fact, the music most in use in North American UGCC Churches in 1962 was of very modern origins (late XIX century). Galician-Austrian schmaltz, including popular town-sqaure melodies and variations upon them. I believe that musically, Galadza intends to help rediscover and rework older melodies and musical traditional long lost to the UGCC due to the Moscovite takeover of most of the lands Kyivan-Rus in the XVIII century. The UGCC became very provincial and it needs recover all of its Kyivan roots. And as to choral tradition, kindly familiarise yourself with the works of Roman Hurko, just to take one example. New compositions that are thoroughly modern and thoroughly traditional at the same time. I’ll adamantly second everything Fr. Dr. McVay has stated. As a UGCC deacon who has done English-language UGCC mission work in uncharted (as far as Greek Catholics go) North American territory as well as attempted to reinvigorate “traditional” liturgical life in several established parishes that have crept into minimalist tendencies his work and approach are epochal in our Church. I could go on at great length with criticism of this blog; for beginners I know no other work in English except his that attempts to restore a number of Irmologion melodies, very integral and foundational elements of the “traditional” Kyivan liturgical chant corpus. Another excellent aspect of the Anthology is actual restoration from “traditional” pew books of the 60s such as allowing an option of all three Antiphons with either the Psalms of Typika or Sunday/weekday psalm verses, Psalm 33, etc. It also has a great variety of chant options including Galician and Kyivan, as well as Znamenny/Irmologion, Carpathian and even some Alaskan, Greek, Melkite and other variants. I’ve had more than one Orthodox acquaintance tell me he wished his church had such a thing. It’s generally not sensible to review or comment about a work with which one is completely unfamiliar and introduces the review with dismissive remarks to that effect. Except I did nothing of the sort, if you, ya know, bothered to read the post. But thanks. Now that I have traced back over my own words, I truly haven’t the foggiest idea what you are going on about. First, I did not “review” the anthology; I simply commented that I don’t use it myself and explained it was for subjective reasons. I am, however, quite aware of its contents. Second, I did not attack the musical settings in the anthology. In fact, I said not a word about the musical settings in it. If I had, I would have praised their inclusion, though that wasn’t really the point of what I was writing. Third, I never said the anthology was inferior to older pew books, and I certainly never called them “traditional.” So I haven’t a clue what you are carping about on that point. So in closing let me say that it is not sensible, indeed embarrassing, for someone to go on criticizing a blog post (and its author) when one hasn’t even bothered to read what’s on the page. I think you are using “new” in a sense far removed from the context in which I was using it. If Fr. Galadza intends to rework older chant traditions and melodies with newer English settings (that is far from clear in his talk, BTW), then I am all for that. In various places I have been supportive of Eastern Orthodox who have undertaken that very task, so I sort of feel like you are quibbling with nobody here. Which music settings, either choral or congregational, has the UGCC been guilty of “toying” with? If it has been “toying” with them, as you imply above, which settings or compositions should it adopt as being most authentic? I’ll admit that I wasn’t as clear as I should have been. I apologize. What is your issue ‘in developing new musical settings and choral pieces for UGCC worship in North America?’ How is such an undertaking imprudent? Is there a logical correlation that I’m missing? Is there a particular genre or period from which we should take our chant and choral settings from? And let me stress the word “new” here since there seems to be some confusion about where I am coming from. I do not consider it “new” when, say, Kievan chant is adapted to English texts or Znamenny melodies are transcribed into Western notation (e.g., Sunday Octocheos published by the Old-Rite Church of the Nativity). I don’t think there is a “magic period” for what it’s worth, though I think some general agreement needs to be made on what is “normative” and at what level such a decision will be taken. For decades one could hear very similar melodies being used in OCA, ROCOR, and MP parishes, though that is starting to change as more and more musical traditions are adapted to English-language texts. I think that’s a great development, though it took awhile to get there. As I said, the process of doing the same in the UGCC (and other Eastern Catholic churches) is already underway, and nothing I said here is critical of that. Let’s keep in mind that this conversation probably wouldn’t have even happened 30 years ago. No, probably not. However, I expect that 30 years ago people would still read complete paragraphs before flying into hysterics. I glanced at an excerpt of the book – the music they have is pretty decent and quite familiar to OCA folks. Hopefully, though, they aren’t the only settings allowed.